After this video, there’s only one deduction we can make: Animal or human – you do not come between a mama and her baby. You do not come between a mamma and her baby! 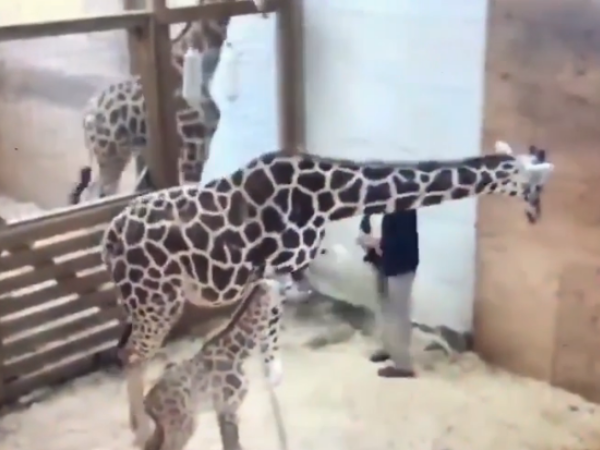 April the giraffe, who became famous after her pregnancy and labour was live streamed online for all the world to follow, kicked a vet in the crotch after he came a little too close to her baby for her liking. Only a day after giving birth, this feisty mother was ready to protect her little one against all perceived threats, thrusting her powerful hind legs at the man's nether regions as he moved in to check her calf. April gained international fame back in February when media organisations started live-streaming her ‘going into labour’ on Facebook, even though she wasn’t. Fortunately, it seems the poor chap wasn’t badly injured, as he managed to make his way out of the enclosure and even offered her a snack as ‘peace offering’ before hurrying out the exit. Vets eventually gave the calf his first check-up and later confirmed his height at 1,7m and weight at 58,5kg. Giraffes can stay pregnant anywhere between 13 to 15 months and April carried her unborn baby to full term. April will raise her calf at Animal Adventure Park, where she lives with her companion, Oliver. The park is now running a contest to name the newborn.